2018 - COATS ran family outdoor art making sessions at Maryon Park Community Garden Open Days. 2017 - COATS run The Emergent Art Therapist; continued professional development for recently qualified art therapists. Highgate Woods. 2016 - 17 COATS ran family outdoor art making sessions at Maryon Park Community Garden Open Days. 2016 COATS in conjunction with Maryon Park Community Garden offered a series of monthly art making workshops. The workshops encouraged participants to explore and deepen their connection with nature through sensory activities, mindfulness meditations and guided walks. 2014 COATS runs a CPD day through The Studio Upstairs for therapists considering taking their practice outdoors. 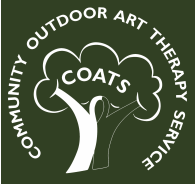 2013 COATS runs a 12-week outdoor group in Hackney for adults suffering from anxiety and depression. 2012 COATS runs four workshops in Springfield park in conjunction with Studio Upstairs, an art therapy project for adults with long term mental health issues. “I loved the 3 trips to Springfield Park and making sculptures out of nature."